In order to improve the quality of treatment, increasing the treatment capacity and to be a total solution for environment protection we are coming up with a new concept.According to type of sewage flow, required treatment process type and environmental conditions, has developed Prefabricated Treatment Packages utilizing Moving Bed Biological Reactor (MBBR) Process and Sequencing Batch Reactor (SBR) Process for sewage biological treatment which incorporate the best technologies in portable treatment systems. We offered Effluent Treatment Plant for Steel Industry. Steel Industry consume water in heavy amount. Water is very precious so we suggest to reuse water. We provide diffrent type of ideas for save &reuse of water which system called EFFLUENT TREATMENT PLANT. Every Industry can apply this technique. We have allredy install huge no of waste water treatment plant in pan india & ABROAD basis. Ventilair Engineers is a leading manufacturer and supplier of Industrial Effluent treatment plants for.These effluent treatment plants are used by different industries to reduce the potential for pollution and to comply with discharge consent conditions. Effluent treatment plant utilizes different technologies and processes for treatment of the waste. They can be streamlined for physiochemical treatment and biological treatment followed by tertiary treatment. Integrated functions with user friendly control makes the operation much easier. Our engineers can also custom design effluent treatment plants based on the specific requirements of the clients. Industrial wastewaters from certain industries don't meet the standards) for discharge, and certainly not for reuse as process water. First of all, the toxic components have to be removed from the wastewater flow. Physicochemical wastewater treatment is a frequently used technique in the area of wastewater treatment. Physicochemical wastewater treatment techniques are applied for the removal of heavy metals, oils and greases, suspended matter and emulating organic substances, organic and inorganic components, difficult to decompose, non polar organic substances, toxic pollutants or high salt concentrations, phosphorus. The physicochemical wastewater treatment techniques are used as pre-treatment, final treatment as well as specific treatment for wastewater reuse as process water. We have a huge range for effluent treatment these areETP for Vehicle Washing (water recycling plant)Turnkey Etp, Etp for Rice Mill, Etp for Small Food Industries, Etp for Dry-Clean Industries Etp for Textile Industries, Etp for Food industries Etp for Oily Water, Etp for Laundry, Water, ETP, Industrial Etp, ETP for various Industries, Packaged ETP, Etp for Print Industry, ETP for Seeds Rinsing, Etp for Rail Coach, ETP for Iron Removal, ETP Plant For Automobile, Small Scale ETP, ETP For Oils And Grease Removal, Complex Organic Chemicals Industry Etp, Etp For Acids And Alkalis, ETP for Dying Industry, ETP for Electroplating Plant, Etp for Hospital, Etp for Paper Industry, Physico- Chemical Process Of WTP Waste Water treatment Recycle Machine, Wastewater Treatment Plant For Construction (MBBR Process, Etp for Pulp And Paper Industry, ETP For Fabric Factory, Etp for Construction Site. 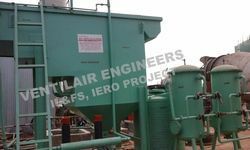 "Ventilair engineers" is a leading manufacturer supplier company of effluent treatment plants sewage treatment plants (etp/stp) in india and abroad. We have already installed 700 above plants. Ventilair engineers have also installed effluent treatment plant for construction sites. This unit is designed and installed for M/S. IL FS ENGINEERING CONSTRUCTION CO. PVT. LTD. (PALM GARDEN PROJECT) by VENTILAIR ENGINEERS. as a part of our comprehensive program of making the earth surface clean and environmentally friendly we are successfully engaged in addressing the growing demands of water, industrial waste and effluent treatment plants. The sewage treatment plants offered by us is most scientific and accurate in getting rid of the sewage in most effective manner. large scale construction project go on for 4 to 5 years this construction site need water treatment facility, especially domestic sewage from the labourers working at site. The most common method to deal with daily sewage water is to transport domestic sewage using tankers, but this process is time consuming expensive. We are engaged in manufacturing and supplying a quality-approved range of 50KLD Effluent Treatment Plant.